Ever wonder why state and local government can’t run billions and trillions in deficits and the federal government can? True, lower levels of government typically have rules in place that prevent it, but there’s more going on. What restrains them are the same forces that restrain corporations, small businesses, and even you from running up an endless amount of debt. It doesn’t matter how much you beg, if your creditor thinks you are a default risk, you are toast. Think about it from your own point of view. You have a house debt, a car debt, and your credit card debt is growing. Inspired by a scene in Real Housewives, you try to borrow another $16K on a big Bloomingdale’s trip. The card is declined. You hit the roof and call the bank. This is the market applying discipline to your spending habits. You might want more, more, more, but the market itself is imposing limits on you. It doesn’t matter how much you beg, if your creditor thinks you are a default risk, you are toast. You need to cool it and bring your spending in line with reality. The same happens with businesses. Banks say no if the revenue stream does not support more borrowing. And if the corporation issues bonds for investors to buy, the bonds are rated according to default risk. This default risk operates as a premium on the price of the bond. This allows for a market for quality among all types of debt. Bonds are rated most commonly like grades: AAA for the best and D for the worst. The lower the quality of debt, the smaller the market. At some point, there are no buyers remaining. That’s when the spending must stop and the financial discipline must begin. What keeps the market for debt operating in a realistic and responsible way is an accurate, non-distorted default premium on every debt instrument. What keeps the market for debt operating in a realistic and responsible way is an accurate, non-distorted default premium on every debt instrument. The people who are extending the credit need make their best guess on the likelihood that it will be paid back, based on any factors that affect the financial soundness. When rating agencies and lenders underestimate the default risk, default premiums are too low for the actual risk. When defaults occur above the expected rate, default premiums rise, the market shrinks, and investors can take heavy losses. This happened, for example, in the mortgage markets in 2008. The higher default premiums reduced supply of credit and restored discipline to mortgage lending. Far from being a disaster, this is exactly what needed to happen. Now consider the federal government. Its debt is rated by all agencies at AAA, except for Standard & Poor’s where it is a single notch lower at AA+ (a downgrade that was considered as an act of treason when it happened in 2011). These high ratings are ridiculous by normal market standards. The US government has issued about $20 trillion in debt of which the public holds $13.6 trillion, and governments hold the rest. But the government is not paying this debt off. The deficit, which is the amount of new debt the government will issue to cover annual expenses, is $441 billion. On top of that, the government has incurred additional long-term liabilities of $127 trillion and more, for Social Security, Medicare and other promises, and continues to add more at an alarming rate. If we used real-world standards on the ability of the debt insurer to pay, would this debt be a good risk? That’s a tough question because markets correctly assume that there are no circumstances under which it will not be paid. The market is behaving entirely rationally here; what’s irrational are the conditions that permit the government to evade all normal standards of fiscal discipline. We’ve already seen how market-based risk assessment is the real limit on the ability of individuals and institutions to run up endless amounts of debt. The problem is that this market seems to allow the federal government a limitless capacity to continue to add to its debt and unfunded liabilities. Notice that this problem didn’t actually become one until the limits on the ability of the Fed to create an infinite inflation were completely removed until after 1971. Once the last remnants of the gold standard were wiped out, the limits on the ability of the government to expand were effectively removed. If you want Congress to restrain spending, lectures and laws are not going to do it. Think of your own case. 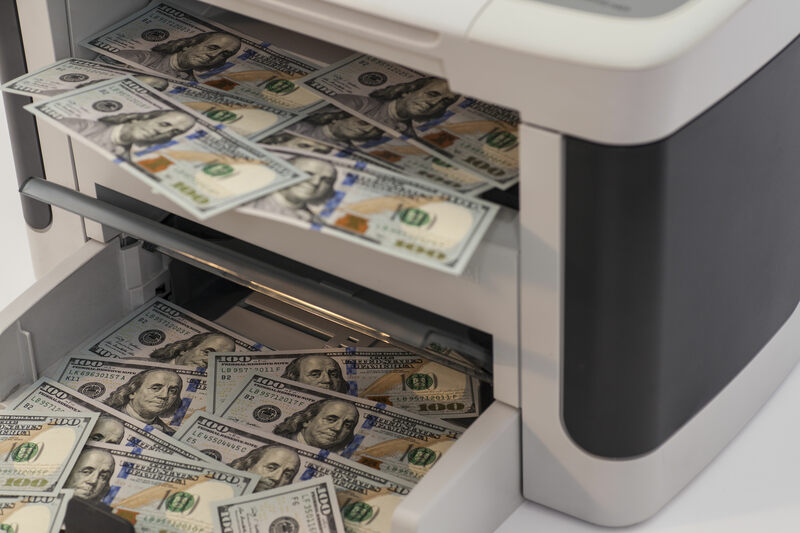 If you could explain to the bank that you have a printing press in your basement that allows you to supplement your income whenever necessary, the bank might send you on your way and approve that $16K transaction. But you do not. Neither do state governments. Neither do corporations. If you want Congress to restrain spending, lectures and laws are not going to do it. What you need is a realistic default premium on US debt so that spending is disciplined by market standards. But this requires, above all else, getting rid of the promise to bail out the government no matter what. Yep, that would mean ending the whole underlying purpose of the central bank. It would mean, in effect, abolishing the Fed itself. We must end the power of the government to pay for its profligacy by leaning on the Fed to print money. Only that will bring market discipline to government. Just like it brings discipline to state government, corporations, and you and me. So long as the central bank stands ready to pay for whatever Congress does, there is no practical reason for Congress to restrain spending, much less pay off the debt. This is why all the homilies you hear every day now on the danger of the debt and deficit – and why the US must never cut taxes for fear of increasing them – are mostly political rhetoric designed to perpetuate the ongoing pillaging of the American taxpayer. The way to restrain debt accumulation is through spending control, and the way to impose that is through market discipline under real-world conditions. The real world, in this case, means ending the power of the federal government to pay for its profligacy with money printing. Until that happens, all promises to restrain government spending are worth as much as the Continental. The key that opened the door to fed. gov.’s outrageous spending was the income tax, followed by other employment taxes, and ignited by withholding. The graduated income tax was one of the ten planks in Karl Marx’s Communist Manifesto designed to undermine the right to private property and thereby individual freedom. The income tax is the Holy Grail of progressives. Americans’ freedom will never be restored so long as the income tax lives and the IRS enforces it–regardless of any restraints of the Bill of Rights.